It has always been a favorite dessert in fine dining establishments. Flourless Chocolate Cake is that elegant finishing touch that makes a gourmet meal satisfying, sweet and complete. But can you really create a delicious chocolate cake with just three ingredients? Yes you can, and that’s what makes this cake so delightful. You really don’t believe it until comes out of the oven, cooled and ready to be cut. Before making this particular 3-ingredient chocolate wonder, I spent hours viewing flourless chocolate cake recipes and techniques on line. Do you use eggs straight from the frig or should they be room temperature? Do you melt the chocolate and butter over the stove in a double boiler or in the microwave? Do you bake the cake in a water bath or not? Does it take 20 minutes in a high temperature oven or 1 hour in lower temperature? So many questions! Finally, why would you put garbanzo beans, black beans or quinoa in the batter when all you really need to create chocolate decadence are three simple ingredients: chocolate, eggs and butter. (I did take liberties however, and added a pinch of salt to sharpen up the flavors, but it’s still basically three ingredients.) Most of the videos had decent results, but I was set on keeping it simple so this cake could possibly be declared one of your new go-to treats. I think it will be because it’s decadently delicious and as easy as one, two, three! 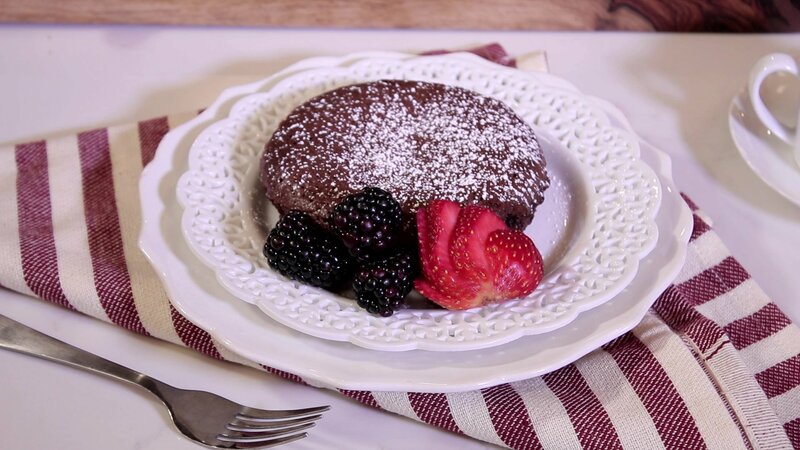 Watch my How To Video for Flourless Chocolate Cake here!